Homelessness is personal to Keara Vogt Wrightsman. Keara, a Union psychology student, was homeless for 10 years before she entered a treatment facility in 2014, at 23 weeks pregnant. She graduated, had a new baby, checked into a women’s homeless shelter, and now works at Talbert House — a nonprofit that helps men, women, and children throughout Southwest Ohio overcome adversity to become healthy and productive citizens. 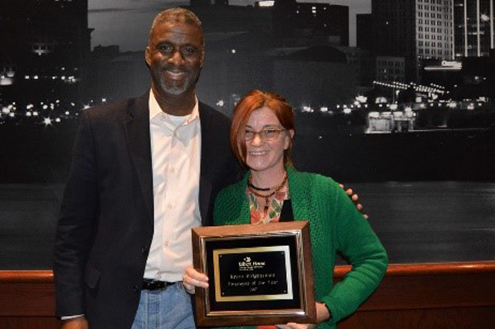 Her determination to change her outcome was recognized with the 2017 Jimmy Render Award from the Cincinnati Homeless Coalition that is given to homeless or formerly homeless individuals who have defied the odds and subsequently committed themselves to addressing the needs of people experiencing homelessness. In 2018, she was named the Talbert House Employee of the Year for her outstanding work placing homeless United States military veterans, both men and women, into housing and assisting them with employment and expedited Social Security claims. Read about Keara and her plans in the Q&A below. Q. What do you plan to do with your degree? A. I am pursuing a bachelor’s in psychology in order to help treat and assess those who have been where I have and the understanding and knowledge to also help those who have been where I never have. My career goal is to be a clinical case manager and move on to my master’s degree. I work at Talbert House helping the homeless find employment and housing. I hope my story is an example to others who are struggling. Because of my homeless related background, no one would hire me. Finally, Talbert House took a chance on me. I am trying to help. I also serve on the Affordable Housing Advocates Board, the Greater Cincinnati Homeless Coalition, Heroin Coalition, Homeless Clearinghouse, Employment Work Group and the Veteran Work Group. Q. What led you to this program? A. My passion is to help people; especially those without a home or who are afflicted with addiction. In order to do that on all levels and to the fullest, I need to have a degree and higher education. A lot of change comes from the work groups and systematic change is needed for permanent change. Q. Why did you choose Union for your studies? A. This is my second time at Union. I had started in 2013 and dropped out. I have to have a university that respects my work and life. Union does that for me. Q. If you could give a piece of advice to your 20 something, what would it be? A. Stay focused/ Don’t give up and reach out when you need help. Never give up! Q. Who has influenced you the most in your life, and how have they influenced you? A. My current supervisor believed in me, when no one else did. She has given me the opportunity to grow exponentially. My passion for helping others and wanting to see change has pushed and influenced me as a person, throughout my entire life. 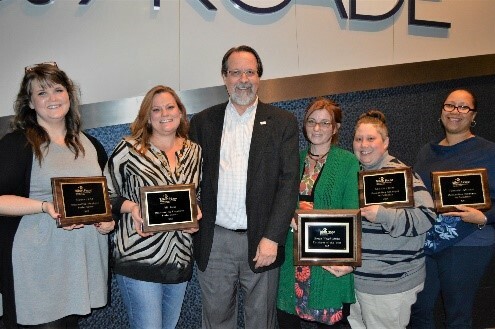 Talbert House honors Keara Wrightsman as Employee of the Year. Left to right, James Wilson, Talbert House Vice President Housing Service Line with Keara at the Talbert House Annual Employee Appreciation Celebration in January 2018. Keara is also a UI&U student. Keara and other staff members also honored for outstanding service at the Talbert House Annual Employee Appreciation Celebration. Center is Neil Tillow, Talbert House CEO President.  Union’s Psychology program is led by expert practitioners in the field of psychology. The program also as an ideal preparation for students interested in pursuing a career in clinical or counseling psychology through graduate-level study and is closely aligned with Union’s Master of Arts major in Clinical Mental Health Counseling, which even allows qualified students to begin their Master’s during their final term of the major. In addition, there is an accelerated pathway from the B.A. program to the fully online Master of Arts degree program, where students can select from five unique majors. Start today. Click below.